You can enter settings for the time scale or the resource chart here. Depending on the presentation that is currently selected, not all settings may be available. The time scale for the calendar can be defined here. Enter the corresponding times in the two fields to make your selection. Additional columns are shown in the chart, correspondingly titled "before" and "after". Defines which interval, which is specified with an integer here, of which unit (Hours or Minutes) should be used for the chart. 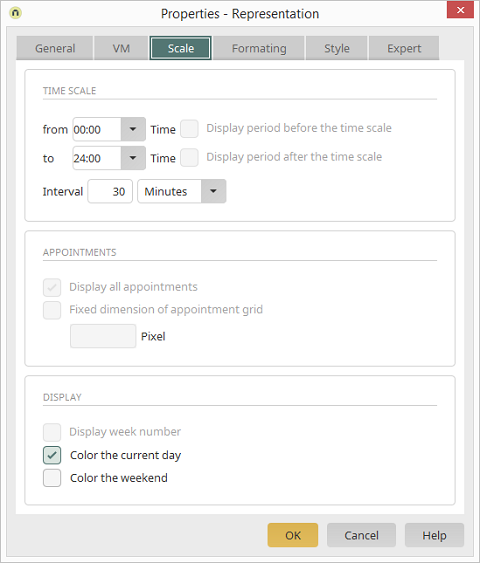 If this setting is not active, a small field to be shown underneath an appointment with the number of total appointments in this interval (such as on this day); the other appointments can be shown via this field. Define in pixels how much space the text for an appointment may take up. Appointments with longer text will be cut off after this point. The calendar week will be shown in suitable presentations with this setting. Highlights the current day, separating it from other days. Puts a shadow around Saturday and Sunday, separating them from the workdays.